In this article, we will try to investigate quick and efficient ways to export data from Excel to CSV and learn how to convert Excel to CSV keeping all special characters and foreign symbols intact. The below methods work for all versions of Excel 2016, 2013, 2010 and 2007. If you need to export an Excel file to some other application, e.g. to the Outlook Address book or Access database, you can convert your Excel worksheet to CSV first and then import a .csv file in another program. Below you will find the step-by-step instructions to export an Excel workbook to the CSV format by using Excel's Save As command. In your Excel workbook, switch to the File tab, and then click Save As. Alternatively, you can press F12 to open the same Save As dialog. CSV (comma delimited). This format saves an Excel file as a comma-separated text that can be used in another Windows program or another version of Windows operating system. CSV (Macintosh). This format saves your Excel workbook as a comma-separated file for use on Mac operating system. CSV (MS-DOS). Saves your Excel file as a comma-separated file for use on the MS-DOS operating system. Unicode Text (*txt). This is a computing industry standard supported by almost all current operating systems including Windows, Macintosh, Linux and Solaris Unix. It can handle characters of almost all modern languages and even some ancient ones. 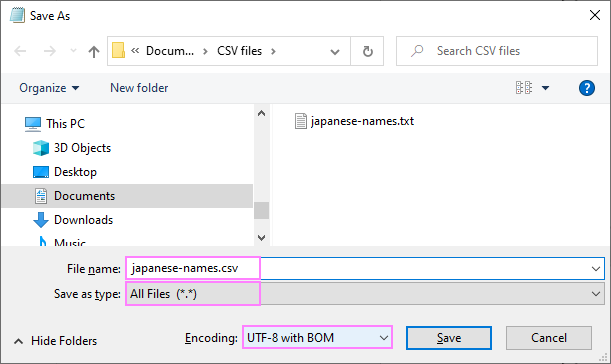 So, if you Excel file contains data in a foreign language, save it in the Unicode Text format first and then convert to CSV, as explained in Exporting Excel to CSV UTF-8 or UTF-16. Note. All of the above mentioned formats save only the active Excel sheet. After you click Save, Excel will display two dialogs. Don't worry, these are not error messages and everything is going right. This is how you convert Excel to CSV. The process is quick and straightforward, and you are unlikely to run into any hurdles along the way. If your Excel spreadsheets contain some special symbols, foreign characters (tildes, accent etc.) or hieroglyphs, then converting Excel to CSV in the way described above won't work. The point is the Save As CSV command distorts any characters other than ASCII (American Standard Code for Information Interchange). And if your Excel file has smart quotes or long dashes (e.g. inherited from the original Word document that was copied /pasted to Excel), these characters would be mangled too. An easy alternative is saving an Excel workbook as a Unicode(.txt) file and then converting it to CSV. In this way you will keep all non-ASCII characters undamaged. Before we proceed further, let me briefly point out the main differences between UTF-8 and UTF-16 encodings so that you can choose the right format in each particular case. UTF-8 is a more compact encoding since it uses 1 to 4 bytes for each symbol. Generally, this format is recommended if ASCII characters are most prevalent in your file because most such characters are stored in one byte each. Another advantage is that a UTF-8 file containing only ASCII characters has absolutely the same encoding as an ASCII file. UTF-16 uses 2 to 4 bytes to store each symbol. However, a UTF-16 file does not always require more storage than UTF-8. For example, Japanese characters take 3 to 4 bytes in UTF-8 and 2 to 4 bytes in UTF-16. So, you may want to use UTF-16 if your Excel data contains any Asian characters, including Japanese, Chinese or Korean. A noticeable disadvantage of this format is that it's not fully compatible with ASCII files and requires some Unicode-aware programs to display them. Please keep this in mind if you are going to import the resulting file somewhere outside of Excel. In your Excel worksheet, go to File > Save As. Name the file and choose Unicode Text (*.txt) from the drop-down list next to "Save as type", and then click Save. Open the unicode .txt file using your preferred text editor, for example Notepad. Note. Some simple text editors do not fully support all Unicode characters, therefore certain characters may display as boxes. In most cases this won't affect the resulting file in any way and you can simply ignore this or use a more advanced text editor such as Notepad++. Since our unicode text file is a tab-delimited file and we want to convert Excel to CSV (comma-separated) file, we need to replace all tabs with commas. Note. 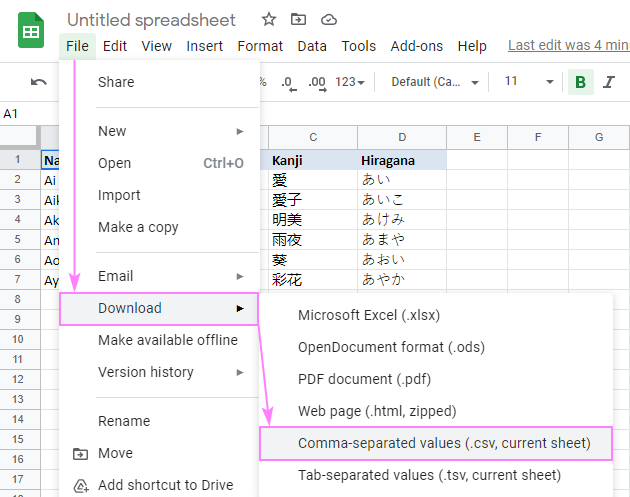 If you do not need exactly the comma-separated file, just any CSV file that Excel can understand, you can skip this step because Microsoft Excel handles tab-separated files fine. Select a tab character, right click it and choose Copy from the context menu, or simply press CTRL+C as shown in the screenshot below. Press CTRL+H to open the Replace dialog and paste the copied tab (CTRL+V) in the Find what field. When you do this, the cursor will move rightwards indicating that the tab was pasted. Type a comma in the Replace with field and click Replace All. Open the Windows Explorer and change the file extension from .txt to .csv. An alternative way is to change the .txt extension to .csv directly in Notepad's Save as dialog and choose All files (*. *) next to Save as type, as shown in the screenshot below. Open the CSV file from Excel by clicking File > Open > Text files (.prn, .txt, .csv) and verify if the data is Okay. Note. If your file is intended for use outside of Excel and the UTF-8 format is a must, do not make any edits in the worksheet, nor should you save a CSV file in Excel, because this may cause encoding problems. If some of the data does not appear right in Excel, open the file in Notepad and fix the data there. Remember to save the file in the UTF-8 format again. Exporting an Excel file as CSV UTF-16 is much quicker and easier than converting to UTF-8. This is because Excel automatically employs the UTF-16 format when saving a file as Unicode (.txt). So, what you do is simply click File > Save As in Excel, select the Unicode Text (*.txt) file format, and then change the file extension to .csv in Windows Explorer. Done! If you need a comma-separated or semicolon-separated CSV file, replace all tabs with commas or semicolons, respectively, in a Notepad or any other text editor of your choosing (see Step 6 above for full details). The methods of exporting Excel to CSV (UTF-8 and UTf-16) we have just described are universal, meaning they work for all special characters and in any Excel version, from 2003 to Excel 2016. There exist a handful of other ways to convert Excel data to CVS. Unlike the previous solutions, they won't produce a pure UTF-8 CSV file (except for OpenOffice that allows exporting Excel files to several UTF encodings), but in most cases they will contain the correct characters which you can painlessly convert to the UTF-8 format later using any text editor. The use of Google Spreadsheet to export an Excel file to CSV seems to be a very simple workaround. Assuming that you already have Google Drive installed, perform the following 5 easy steps. On the Google Drive, click the Create button and choose Spreadsheet. Click Upload and choose a file from your computer. Choose Replace spreadsheet and then click Import. Tip. If you have a relatively small Excel file, then you can simply copy / paste the data to a Google sheet to save time. 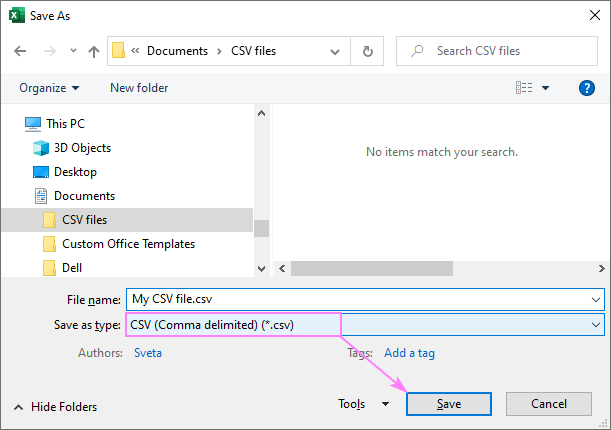 Go to the File menu > Download as, select Comma separated values (CSV, current sheet) and save the SCV file to your computer. This method of converting Excel to CSV hardly needs any further explanations because the heading says it all. I have come across this solution on one of Excel forums, cannot remember now which exactly. To be honest, this method has never worked for me, but many users reported that special characters, which got lost when saving .xlsx directly to .csv, were preserved if to save a .xlsx file to .xls first, and then save .xls as .csv in Excel, as explained in How to convert Excel to CSV. Anyway, you can try this method of exporting Excel to CSV on your side and if it works, this can be a real time-saver. OpenOffice, an open-source suite of applications, includes a spreadsheet application named Calc that is really good at exporting Excel data to CSV format. In fact, it provides more options to convert spreadsheets to CSV files (encodings, delimiters etc.) than Excel and Google Sheets combined. You simply open your Excel file with OpenOffic Calc, click File > Save as… and save the file as Text CSV (.scv) type. In the next step, you will have a choice of various Character sets (encodings) and Field delimiters. Naturally, you select Unicode (UTF-8) and comma if your goal is a CVS UTF-8 file (or whatever encoding and separator character you need) and click OK. Typically, the Text delimiter will remain the default quotation mark ("). You can also use another application of the same kind, LibreOffice, to perform fast and painless Excel to CSV conversions. It would be really nice if Microsoft Excel provided similar options with regard to CSV encodings, agree? These are the ways of converting Excel to CSV I am aware of. If you know other more efficient methods to export an Excel file to CSV, please do share in comments. Thank you for reading! 62 Responses to "How to convert Excel to CSV and export Excel files to CSV UTF-8 format"
They send me a CSV file in which the information is separated into columns. Once I open it on my PC the information per line is displayed in one cell per line and all columns are distringuished with a comma between them (i.e. a comma delimited CSV file), although the person that created it had the information separated into columns. I do not want to use every time the function Data>Text to columns in order to bring the information back to columns. What is wrong with my excel 2007 that I have installed and the CSVs sent to me are only opened in this comma delimited mode? It looks like you and the person who created a .csv file have different decimal and list separators set up in your Windows Region and Language settings. You can find a few possible ways to fix this in this article - Convert CSV to Excel: problems and solutions. Sorry about being a bit off the topic, but really need help. I am trying to save an Excel spreadsheet to a tab delimited text file. Information in the spreadsheet contains french accent symbols. They appear alright in the spread sheet, but after saving a tab delimited file these symbols turn into question marks. Now the most interesting part - i have changed a setting in tools (next to save button) to unicode and unicode utf-8, but none of them changed a thing and. I would really appreciate if someone could help me out with this. It looks really strange. Try saving your spreadsheet as Unicode text and then changing the file extension from .txt to .tsv. It should work. How do i bring 3rd and 4th column of the row to next new line while converting excel to csv. hi! I'm using msoffice 2010. how can i convert excel file to csv file? Exactly as described in this article : ) All the solutions work for Excel 2010 as well. I have been trying using double quotes to ignore the commas within the data value, but still not successful. Will be grateful if you can help me out. This week I was working on some project that uses excel sheet, dbf and ASCII formated data and I was a bit challenged as how to convert data from excel 2007 to the other formats it does not directly have by itself. Finally, I went to GOOGLE search with the question I had and wrote my question on the search bar of google window. Automatically,my problems are resolved by reading the suggestions forwarded by respective experts in the subject matter and I am done with my problem and also I am comfortable using the excel 2007. Thank you so much and I will come to you with questions as I proceed with my project in the preceeding time. I just want save my excel 2010 as csv file and close it. but the converted csv file always show 000000 after the 15th character on the cell. how do we convert the .xls to .csv or .txt usign cmd (dos) ? Wow! Great stuff, nice work. Is it possible to preserve mathematical formulas in an excel sheet when you transfer it to csv format. For example X raise to power 2(X superscript 2) in excel will become X2 in csv. Any idea on how to fix this.. 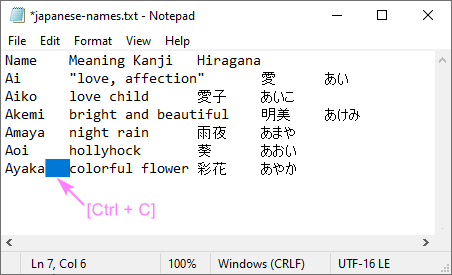 I checked csv converted file opening again in Excel 2013 and Japanese characters were readable. However, not when imported to Outlook 2013. Could you help me in this last step? You are awesome! I've been working on this for a couple hours and banging my head against the wall but did not try to Notepad>Find and Replace thing. Worked like a charm. Also, thank you for your explanations as to why using foreign languages cannot be done the 'above way' and then you perfectly explained how to do it below. Kudos! Literally relieved - and my coworkers will be relieved into the future as well! I am trying to convert Excel to .csv format so I can import into a database. I followed all the steps you listed. However, when I open the .csv file in Notepad to make sure the formatting is correct, I find after the last line of data there are hundreds of commas running down the left side. A co-worker does not have this problem when she tries it on her PC. Which makes me think there is a setting of some kind in Excel or an add-in not enabled that I need on my PC. Our IT staff are not familiar with the "inner workings" of Excel can't really help with this issue. For us to be able to assist you better, please send your Excel and converted files to support@ablebits.com. This section "How to convert Excel to CSV UTF-8" really worked for me, after many unsuccessful attempts trying almost anything, using both Excel and Calc programmes. Save excel file as txt with Unicode, replace, in this txt, tabs with commas and save as csv (UTF-8). CSV file now has all special characters, COOL and many thanks! Tricky problem : I saved my excel file into csv type. All is ok but when I reopen the csv doc the layout is still in table. No comma. Do you have any idea of what I missed ? Please open your file using a text editor like Notepad. See if the comma delimiter is there. I am facing the same issue as that by Muhammad Farooq. I repeat here, when I save my Excel file as csv (Comma delimited) and reopen in Excel, again it is separate columns, instead of being in one column. I have tried many times but not successful. Kindly, explain what wrong I am doing. Yes I also face the same problem. when i open it using notepad I do see comma separated values. How should I proceed ? Excellent, the section "How to convert Excel to CSV UTF-8" was precisely the solution that I needed for my problem! Excel kept saving the csv with semicolons instead of commas, despite having changed the regional settings as had been recommended elsewhere. With this work around I did get the right csv file to import in another system. Dear Svetlana; You did perfect. it was wonderful article that exactly i need. many thanks for your help. How to remove special character while saving xls file into csv file. IT Leaders �trusted service providers� with system. i am typing in Hindi in excel csv formate using Kruti Dev 040 and save.when ever open the same file then hindi text automatically converted in English.so how to solve this problem. 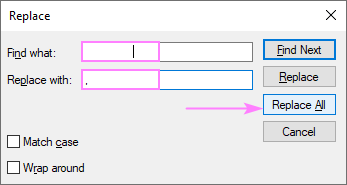 The solution to convert excel to a unicode text and then replacing the delimiter tab with comma or any other user specific delimiter should work. But what if my data is having tab in between the text? Can you suggest a way to convert those excel to UTF encoded CSV or a custom delimited file? Thanks a lot. That saved hours. Is there a way to convert an Excel file that has multiple worksheets into CSV format? It looks like it will only convert one sheet! Please tell how to make csv file corrupt in the ecel file. thanks for the google sheet suggestion works like a charm and the default encoding is really wonderful. Thanks a ton for this useful post!!! AbleBits don't have a botton to do this automatically? Openoffice Calc saves csv files as UTF-8 properly, so I saved my Excel file using Excel as an OpenDocument Spreadsheet (.osd) and opened it in Calc and then saved it as as a .csv file with UTF-8 encoding. Works well. Could someone guide me how to convert Excel ".xlsx" file to UTF-8 format so that I can upload on google analytics. If you follow the steps from this point of the article above, you'll be able to do that. Hi, Please can anyone tell how to convert cvs file to binary file. It clarify my doubt about csv file conversion. Hello, Thanks for posting about "Save .xlsx to .xls and then convert to .csv file"! This worked very well for me! Other methods were creating csv files that were not opening in Excel in the way that I wanted. Would love for AbleBits to create an AddOn that gave us all the ways to export CSVs including choosing delimiters and separators! Great tutorial, and very usefull..